The government has established its plan on the affordable housing programme in Kenya. According to the plan, the government aims to launch the Kenya Mortgage Refinancing Company by February 2019. Discussions between the State Department of Housing and Urban Development and the National Treasury on the establishment of a National Housing Development Fund are also in their final stages. The government has also identified land for development of the 500,000 affordable houses’ especially for the flagship projects, which include Park Road, Starehe, ShauriMoyo and Mavoko whose lease documents are out already. The government will also work with the ICT Authority to develop a housing portal where people can register to buy houses.The review of the Sectional Properties Act is also complete and awaiting tabling in Parliament soon. 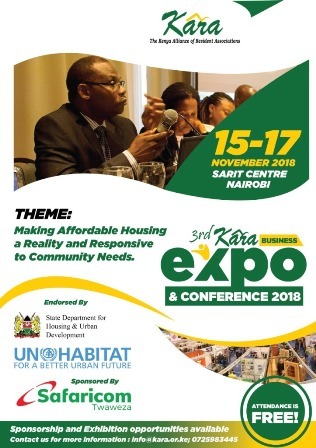 The State Department for Housing and Urban Development has also signed Memorandums of Understanding (MoUs) with county governments for development of at least 2,000 housing units in each county. Eight counties have already signed the MoUs with 14 counties in advanced negotiations, which will lead to building of a total of 48,000 units. The targeted counties include Kiambu, which is expected will give 6,000 houses before the end of the plan, and 2,000 each for Kitui, Homa Bay, Makueni, Nyandarua, TaitaTaveta, Meru, Bungoma, Nyeri,Murang’a, TharakaNithi, Laikipia, UasinGishu, Narok, West Pokot, Kirinyaga, Embu, Kisumu, Kakamega, Trans Nzoia, Mandera and Isiolo.